1/09/2017. Interview by Marta Daniela Santos. On the right: Seven-spot Ladybug (Coccinella septempunctata), by Rod Haley. When we think of ladybugs, we think of little, cute, red insects with black spots. But did you know that not only ladybugs come in many different colors and sizes, but also have an important ecological role as insect pest predators? For the last decades, John E. Losey (Univ. Cornell, USA) has focused his research on ladybugs, studying their ecological role and the shifts that their populations are registering worldwide. Besides academic scientific research, he is also committed to increasing awareness of the public to the importance of biodiversity, and in particular of the role of ladybugs in the environment, involving schools and the society through a citizen science project – the Lost Ladybug Project. John Losey is also involved in the formation of an international specialist group on ladybugs for the IUCN [International Union for Conservation of Nature], which will evaluate individual species for listing on the IUCN red list and will attempt to come up with a more comprehensive and integrated plan globally. This group is expected to start working by the end of 2017. 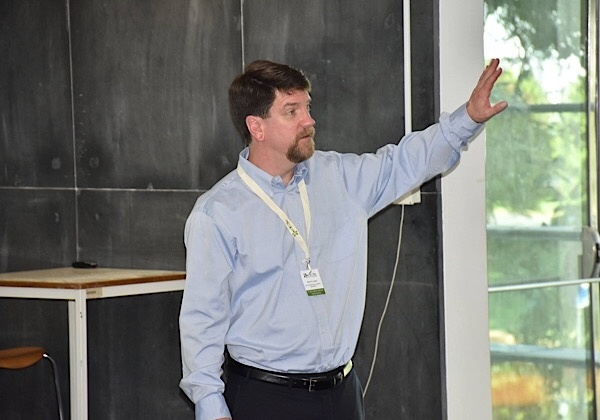 John E. Losey was plenary speaker of the cE3c Annual Meeting 2017, which took place at São Miguel Island (Azores, Portugal) on June 5-6, 2017. The focus of your research on the last decades has been on ladybugs, which we think of as tiny, red and spotted insects. But ladybugs are not always red or spotted, right? Right! There is variation in their background color, which can range anywhere from a deep red through an orange, to a yellow. Some species are actually black, as Chilocoris stigma, the Twice-Stabbed Lady Beetle, with red spots. Even within a single species there can be variation both in their background color and in their spotting pattern. And the background color can also vary based on what they have to eat as larvae. If they don’t have enough to eat, they can be very pale, while if they have the right things to eat and enough of it, they get that deep red color. There is also another thing: ladybugs taste bad to predators. With those red and black colors, they are not trying to blend in – they are advertising “don’t eat me, because I taste bad”. And how bright the red is, has been shown to be linked to how much of the coccinelline, the chemical that makes them taste bad [more about coccinelline here and here]. So, there are hundreds of ladybug species! And what is their ecological role? 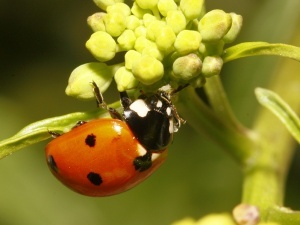 Ladybugs are predators - especially of aphids, and other soft-body insects. These are significant agricultural pests, which means that if we did not have ladybugs, we would not be able to grow the crops that we need to survive. We would have to use a lot more pesticides, and we might not be able to keep on top of the pests at all. But the populations of ladybugs are declining, right? Well, if you look either at any given region, or worldwide, what is actually happening is that the composition of ladybugs is shifting. If you looked back just thirty years ago, you would see that each region had a diverse complex of endemic species [exclusive of that region] and native species [that have arrived at that region by themselves and established there but can also be found elsewhere]. Research has shown that it is this sort of diversity, and especially evenness of different species, that contributes to the most effective pest suppression, because each species does its predation in a slightly different way. But over the last twenty years the Asian ladybeetle has become dominant worldwide, in an unprecedented way. And while this species is a very effective predator, we do not have that ladybug diversity anymore. So, we don’t know of any ladybug species worldwide that has gone extinct. But we do know that a lot of the native species have declined and exist in just tiny pockets, where they used to be common. One of our concerns is that this loss of diversity and evenness could lead to less effective pest population. And another concern is: since the Asian ladybeetle is such a dominant species, could there be the potential for a pandemic, a disease that spreads among them? And if that happens, do we have enough of ladybeetle diversity to pick up the slack? You are the founder and director of the Lost Ladybug Project. Can you tell us a bit more about this project? One of the reasons that got us started was the decline of the nine-spotted ladybug, Coccinella novemnotata – the New York state insect. This is still our flagship species, and one of our main focus of research - but now that we are up and running we are interested in the whole sweep of native and introduced species. Broadly, in the Lost Ladybug Project we provide information and education about biodiversity, and specifically about ladybugs and their role in the environment. And you can also participate in the project by going out and surveying for ladybugs. One of the things that is almost unique to this project is that every data point is backed up by an identified image of a ladybug. In the past, part of the problem was that the identification of the species by non-specialists introduced a lot of errors. So now our spotters – that’s what we call our volunteers – send in their images and then a ladybug expert identifies each one to species. And we only include in the database the ones identified to species. The spotters have an option to make a preliminary diagnosis of the species, and we always give feedback to them. But as for the data itself, it is always backed up by a specialist. And how is the project going? One of the interesting things that happens in a lot of citizen science projects is that people tend to self-select what they put in. If they think they have a rare species, they are really excited to upload it. While if they think they have a common one, they will probably upload it but the probability is not quite as high. So, from our data, we have been able to say that in certain places – such as in Long Island in New York, on the West Coast in Oregon and in South Dakota, for example – there are little pockets of populations of rarer species, which seem to be persistent. But the probability that those smaller, unconnected populations persist in the long-term is low. To conclude: if we see a ladybug, what can we do to contribute to science? Of course, the native species will differ from country to country, as well as the citizen science projects – but what can we do in a broader sense? You may have heard the phrase “a rising tide raises all boats”. I would like to say, “a rising tide raises all beetles” [laughs]. One of the things on which we are doing research now is what plants can we put out there – be it in your farm, your garden or just your backyard – that can benefit ladybugs in general. You can also manage your pesticide use to facilitate ladybugs. You can reflect on what to spray - because some products are harsher on ladybugs that others -, when to spray – trying to miss the peak of their populations – and where to spray – if you know ladybugs are on certain plants, maybe you can avoid those when you are spraying. In the US, through the Lost Ladybug Project, we are working on a new project where we are learning to efficiently raise the nine-spotted ladybug in the lab. And we can provide, just for the cost of rearing and shipping, nine-spotted ladybugs which can be used for pest control in your garden instead of pesticides.